From May 5 to 8, 2007, the AES Pro Audio Expo was held in Vienna, often described as Europe’s cultural capital. The preceeding AES Convention in Vienna was held in 1992. 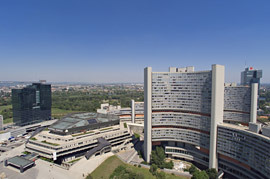 15 years later, the ACV (Austria Center Vienna) is now part of a large international congress area with international hotels, restaurants and direct access by public transport. The ACV itself has undergone substantial refurbishment and modernization in recent years, making it a five-star conference centre with large exhibition halls and a wide selection of rooms for conferences and demonstrations. For over 50 years, the AES has been the largest gathering of audio professionals and enthusiasts on the globe, attracting delegates from over 100 countries worldwide. Benefits for the audio community: Shaping the world of audio. AES is the one event that combines exhibits with high-profile technical sessions and user seminars. In doing so, we bring together the pro-audio scientific elite, the leading manufacturers, the decision-makers and users and enthusiasts from around the world. Their combined efforts are the driving force of the AES Technical Committees that help shape and standardize the audio industry.